By Dr. Russell Blaylock, M.D. Dr. Blaylock: What most people don’t know, particularly oncologists don’t seem to understand, is that chemotherapy, radiation, conventional treatments all are inflammatory. 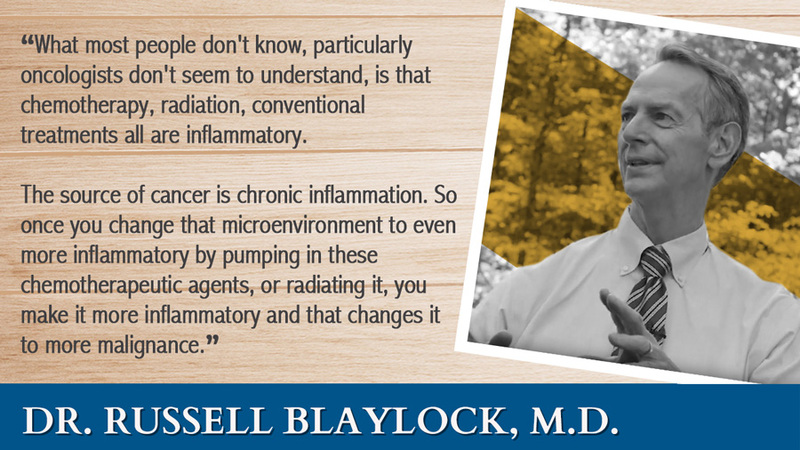 The source of cancer is chronic inflammation. So once you change that microenvironment to even more inflammatory by pumping in these chemotherapeutic agents, or radiating it, you make it more inflammatory and that changes it to more malignance. Ty Bollinger: So it’s adding fuel to the fire. Dr. Blaylock: So if the chemotherapy and radiation doesn’t kill everything, all the cancer cells, and wipe out the stem cells, you’ve really made things worse and not better. And that’s what we’re finding. In fact, I just wrote an article on that — it’s going to be published real soon — about the effect of microenvironment and inflammation; microenvironment and cancer growth. And invasion, particularly invasion, it makes the cancer more invasive. And that’s because once you stimulate that cell with this inflammation it starts secreting what they call “metalloproteinases,” which are enzymes that dissolve the blood vessel wall. So all these cancers start pouring into blood vessels and that makes the cancer spread. And that’s what it’s doing. The inflammation turns on these enzymes that make the cancer penetrate tissue, break through these barriers that the body tried to put around the cancer to keep it from spreading, and that makes it worse. Ty Bollinger: And that’s what the tumor really is; that wall of the tumor is the body walling off those cells. Dr. Blaylock: Right. Usually, it tries to form a capsule around it, a fibrous capsule. This is why vitamin C and things that increase that fibrous capsule’s strength help out in cancer because it’s helping contain it. And certain flavonoids, for instance, will suppress those proteinase enzymes. For instance, like curcumin, quercetin, ellagic acid, they suppress those enzymes so that the cancer can’t penetrate. And then it’s a localized cancer and then it’s easy to get rid of. Ty Bollinger: Do we have medical literature that backs up the use of flavonoids? Are there studies where the literature shows—? Dr. Blaylock: Numerous, numerous studies. This is one of the hottest fields of research in cancer. It’s flavonoids, plant extracts, and their effect on cancer. The problem is is that clinician is not reading the journal articles in his own journal. All these—they’re in there, the clinical journals, they’re in the research for oncology journals. They’re just not reading them because they don’t understand it. It’s a lot of biochemistry. It’s a lot of mechanism they’re not familiar with. They’re not familiar with the plants. They don’t know how to give it. They don’t know that these extracts are purified and available. For instance, you see in leukemia research, they have absolutely shown that leukemia is much more curable if you use quercetin. Most of the leukemias are very sensitive to quercetin. Lymphomas, all of these things, are curcumin, quercetin, ellagic acid, and resveratrol. All of these things inhibit the cancer stem cell. And that’s what’s interesting about this. For instance, curcumin actually kills the stem cell, this cancer stem cell. It doesn’t bother normal stem cells but only cancer stem cells. Dr. Blaylock: Curcumin. And that’s the other thing about flavonoids and these plant extracts is that they’re very selective. They only damage, inhibit, and kill cancer cells. They have no effect on the normal cells except to make the normal cells stronger. Ty Bollinger: So that selective toxicity. That’s a big thing because you don’t want to kill the good cells. You want to kill only the cancerous. Dr. Blaylock: That’s what they always look for, what they call the “magic bullet.” Something that will kill the cancer cell and not hurt the normal cell. Well, this does even more. It kills the cancer cell, but it makes the normal cell stronger. And so what they found out, for instance, in radiation treatment of breast cancers, colon cancers, and lung cancers, is that it actually makes the radiation much more effective. And it protects the tissue that’s being radiated that’s normal around the cancer. Ty Bollinger: Really? And all of these do, the ellagic acid, the resveratrol, curcumin. Dr. Blaylock: It’s a long list of them. Naringenin and ellagic acid, and resveratrol. Ty Bollinger: And they affect the stem cells? Dr. Blaylock: They kill the stem cells and suppress the stem cell growth. They kill the daughter cancer cells. They help encase the cancer. They suppress these invasion enzymes and reduce the metastasis. And they protect the tissue, the normal tissue, to help keep it from converting to the same process. Because when they did this study to see if inflammation is the cause of cancer, most people who have cancer should have chronic inflammation. So they did this large study and that’s exactly what they found. For instance, in certain people, 70% of them had definable inflammation—you know, arthritis, chronic atherosclerosis, some chronic infections. And that’s what caused the cancer. If you stop inflammation you stop the cancer from ever forming. Ty Bollinger: So do these substances you’re talking about, these flavonoids, do they have any effect on the inflammation? Dr. Blaylock: They’re powerful anti-inflammatories. They’re very powerful anti-inflammatories. That’s how they are preventing the cancer from occurring. And then they have other mechanisms that affect the cell signaling that kills the cancer, turns on the cancer suicide gene like p21, p53. And that’ll make this cancer cell commit suicide – what we call apoptosis. Ty Bollinger: Dr. Blaylock, in light of the fact that these flavonoids are so beneficial why is not every oncologist using them to treat cancer? Dr. Blaylock: Well, because they don’t read their articles, and they don’t know what these flavonoids are because they don’t know the chemistry. They’ve never heard of it. They go to a meeting and the meeting is about the latest protocol and the latest chemotherapeutic drug. And who sponsors the meeting? Makers of the chemotherapeutic drug. So you have a room full of oncologists listening to the latest drug and they’ll say, “Oh, this one. We’re getting incredible responses with this drug.” Well, as I explained, what happens to that incredible response, it causes dramatic shrinkage of the tumor initially because it’s just killing the daughter cells. So they’re using the wrong measurement stick for success. About Dr. Russell Blaylock, M.D. Dr. Russell Blaylock, M.D. is a nationally recognized board-certified neurosurgeon, health practitioner, author and lecturer. 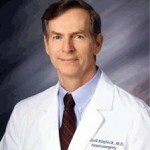 For over a quarter of a century, he practiced in the demanding field of neurosurgery in addition to having a nutritional practice. He recently retired from his neurosurgical duties to devote his full attention to nutritional studies and research. Dr. Blaylock has authored three books on nutrition and wellness: "Excitotoxins: The Taste That Kills," "Health and Nutrition Secrets That Can Save Your Life" & "Natural Strategies for Cancer Patients." she is 75 y/old this is the 4 time she had cancer, 2004 R mastectomy/ 2005 lymphoma/ 2015 skin cancer on the nose/ 2017 L breast cancer with lumpectomy/and now is worse! metastases in all her bones… we want the whole breast removed like in 2004 for the R now is too late is all over… she is loosing weigh really fast an I believe that we can do more for her… please help me to help her. What can I give her? She is not getting chimo or radiation only a 1 pill at night . I grow soursop leaves free for everyone to try , just pay for there postage, or if the live close by you can help your selfs, they say by broiling the leaves up in water just like making your self a cup of tea, they say it a thousand time more effective than chemotherapy. Praying that you are well. As Terry just said, Ginger root and Turmeric given with a pinch of pepper and any fat is a powerful remedy. I wouldn’t use the milk because of The China Study saying that Casein in milk increases Cancer cell growth. Vegetable oils do, too. But having an Omega 3 source like flaxseed or hempseed or CBD oil are useful, because the pepper, plus oil brings the turmeric and ginger into the cell faster. You either have to go Whole Food Plant Based vegan or Keto or both. For Vegan, see Dr. Greger or Dr. Fuhrman or Dr. McDougall or do Gerson. They all have free videos online. Vegan gets rid of Cancer by getting rid of growth hormone and methionine as its mechanism and by adding in phytonutrients like the ones mentioned. Garlic is the most powerful one. Broccoli Sprouts would be another. You can buy them at Whole Foods. Most of them would say, “no oil” vegan because that would unblock your pancreas and make sure your blood glucose would be normalized. If you choose Keto, the mechanism would be by getting rid of glucose, the body can also turn fat into glucose, but with either diet, you can use Modified Citrus Pectin in high enough dosages to cause the Cancer to not be able to bind with glucose. Drink Matcha tea without milk. Green tea and Turmeric are close to chemo drugs with the number of mechanisms. If you hate the taste of them, buy empty capsules and fill them with the powdered drink. Don’t buy green tea extract supplements. See Dr. Greger’s videos, because the extract doesn’t work like the tea. It kills you faster. The broccoli supplements don’t work either. I am going to add look into Beta Glucans. My dog has Hemangiosarcoma and that is an aggressive Cancer where he wasn’t expected to live a month, but there was a study with Medicinal Mushrooms – Turkey Tail where just adding that to the diet kept dogs alive up to a year with his condition. Beta Glucans are powerful. There are studies on most mushrooms. Maitake Pro4x is one, which I give my dog. I mean it though, most of them have been studied against one cancer or another. Beta Glucan is so powerful. Dr. Greger did a study from Japan where people with end-stage cancer lived much longer with the Beta Glucans equivalent to a pinch of Nutritional Yeast. Lots of people do Transfer Point Beta Glucan, which is from Baker’s yeast. I am giving my dog CBD oil and he likes it. Also look into enzymes. The concept of enzymes is that cancer is surrounded by a coating of 15 layers of fibrin and that most of us as we age don’t have as much acid in our stomachs to digest animal products properly, so we end up using up all of our trypsin and chymotrypsin, which are the enzymes, which digest meat, but they are also the enzymes, which digest the fibrin protecting the Cancer. With those, you take them away from meals and people take whole bottles of them. 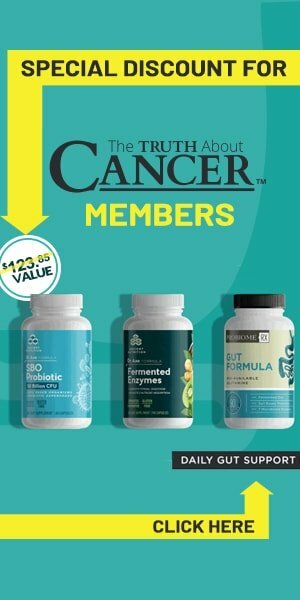 Wobenzyme sells them by the 500 pills and that doesn’t last long, but people have survived even end-stage pancreatic cancer because of the pills. Providers have an interest in NOT knowing the literature because many are compensated by PHARMA to stay on specific PHARMA Protocols. Plus they are flat out LAZY. Same with Hormone Replacement benefits!!! Sorry if I gave you too much information. I would say mostly eat ORGANIC raw vegetables. Raw gives enzymes. Not everything has to be raw. Tomatoes actually give more nutrition cooked. Some vegetables have a high kill rate with Cancer. Garlic, Onions, Leeks, Cauliflower, Cabbage, Broccoli Sprouts, Brussel Sprouts, Beets, Dandelion Greens, Walnuts, Pecans, Cranberries, Lemons, and herbs and spices are what I am going to tell you. Some vegetables like artichoke and parsley are highly anti-angiogenesis. There is a chart for anti-angiogenesis foods online. You can google it. Other foods are high at apoptosis and that goes back to the green tea, turmeric, ginger, etc. If you do vegan, foods like sweet potatoes, apples with the peel on, berries all are cancer fighters. Blueberries doubles the natural killer cells. The spice cardamom increases how efficiently the natural killer cells work. It can be put in a capsule if you don’t like it. It needs a pinch of pepper. Where can I get hold of 6ZO in the UK? I have followed the truth about cancer for quite some time and read many of the comments, fascinating if you don’t have cancer, but totally confusing and stressful to read when you have cancer…there are so many natural options and natural anti cancer food and herbs, mushrooms etc promoted, but obviously you cant follow or take all of it, so when you are desperate and feel already like —-, have no money to see one of these experts, you feel even more horrible because you don’t know what is the best option for you. Why can’t there be a protocol for each type of cancer that has the most validation and success to date, of course there are no guarantees, but at least someone with cancer has some idea were to best start. Thank you for reaching out to us and sharing this with us. Please know we are here to help in any way that we can. I know a doctor in Nigeria, seeking to go practice in UK, but his stumbling block is that he has chronic hepatitis b. I don’t know if you have an idea of how he can get rid of this disease in his system. He is so depressed and unhappy. I’m so sorry to hear about this – I’ll be sure to pray for him.